News > Up to Date > Dr. Walser Dental donates to "Angel for Africa"
The "Angel of Africa", as Anni Wieser is called, fights year after year against hunger and the great suffering in Africa. Year in, year out, in the capital and outskirts of the West African state of Burkina Faso, which translates as the land of the righteous, the sprightly retiree has been donating personal money, gifts and small presents to the needy each year. When winter is here and temperatures in Africa are around 30 ° C, Anna flies to West Africa. On the 9th of January 2019 the time has come again and she will stay there for two weeks. Anna has exceeded her annual goal of the minimum sum of 8000.- € clearly by the donation of Dr. Walser Dental, for which she thanked warmly with the words to Gerhard R. Daiger: "such a high amount I never got!". This minimum sum would be needed every year, so that the journey is worthwhile to help many needy, she explains Gerhard Daiger. What began in 2010 with the modest sale of home-made, dried apple rings and a few private items developed over the years into a major media-savvy action (newspapers, SWR TV and Radio Munot reported). Every day from morning to evening Anni Wieser sells at her stand, which is located at the town center of Stahringen, lots of Christmas decorations, small gift ideas, but also household items. She sells more than 1,000 items a year, investing more than 1500 hours to do so. Depending on the season, she adjusts the sales booth. If you are looking for a gift, valuable porcelain or fancy collectibles, this is the place for you. Everyone can also just "browse" the sales for Africa. Every penny that Anni takes here, she hands over personally to the poorest of the poor in Burkina Faso. She does not want anything for her work. On the contrary, she painstakingly saves the flight and all the travel and accommodation costs, which she pays herself as in previous years; that goes without saying for her. She hands the money personally to the communities and helps with food distribution. She receives support from the pastors of the African communities with whom she is in close contact. With the donations Anni buys hundreds of kilos of rice, corn, millet or bread and also supports sanctuaries for sick and malnourished children. With these foods many lives can be saved. A daily ration from which a family has to live is just a single cup of corn. About 61% of the population has to live on less than € 0.80 per day. Heart projects of Anni Wieser are among others child and baby orphanages, education for orphans and clothing for communities. So Anni has been able to help many people, children, families, entire villages as well as communities, disabled people and their relatives in recent years. For the equivalent of 30 euros a bag of rice and for 60 euros a water filter can be bought, which ensures a whole family for a lifetime the supply of drinking water, says Mama Anni, as the Africans affectionately call her. Here is a TV report about Anni Wieser in the SWR Landesschau Baden-Württemberg, September 2018. She thanks everyone for her valuable help and wishes them God's blessing. When Anna returns from Burkina Faso on January 24, 2019, she will, as every year, give lectures, accompanied by photos, to tell donors and interested parties in detail how and where she helped - thanks to their support. Incidentally, Anni Wieser also sells organic apples, apple rings and apple juice (also available in Stahringen in Hauptstrasse 48a)! 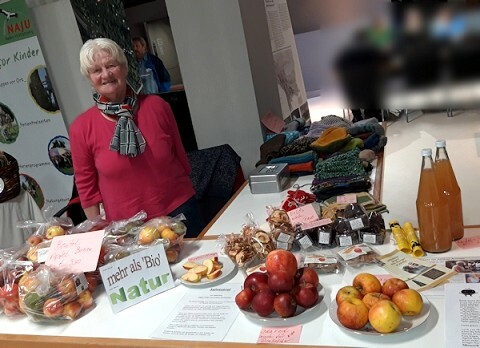 Anna with her stand at the Naturschutztage Bodensee 2019 Radolfzell. With her presence for over 20 years, she is now part of the inventory and is better known locally as "the apple woman".